The Islamic State’s South Asia branch complicates regional efforts to move Afghanistan toward peace. The Trump Administration is supportive of Afghan President Ashraf Ghani’s call for talks with the Taliban in order to bring peace to Afghanistan. Russia, Iran and China have also reached out to the group The interest in talking to the Taliban is partly the result of concerns about the Islamic State in Afghanistan. Calling itself Wilayat Khorasan, the Islamic State’s South Asian branch is more commonly referred in Western media as ISIS-K or ISKP (Islamic State Khorasan Province). ISKP lays claim to an emirate comprising parts of Iran, three Central Asian republics, Afghanistan, Pakistan and in some maps parts of Kashmir in India and Xinjiang in western China. The group has sworn loyalty to Abu Bakr al-Baghdadi even though most analysts agree that at least in the early years there was little or no connection between this group and the Islamic State in the Middle East. The United States, Russia, China, Pakistan, and Iran have expressed concern about ISKP. Afghanistan and India see it as a breakaway faction of the Tehreek-e-Taliban, Pakistan (TTP) which has been groomed by the ISI, Pakistan’s intelligence services. The Afghan government estimates that there are 3,000-5,000 fighters in the group in Afghanistan, their ranks having swelled with combatants leaving Iraq and Syria. Analysts like Afghanistan expert Antonio Giustozzi point to the weakening of support for the group as it splintered into factions in the summer of 2017 due to internal disputes over leadership and direction However, for U.S. policymakers in the Trump administration trying to extricate the United States from Afghanistan, the concern is that the ideological, recruitment, and fundraising capabilities of ISKP could weaken support for the Taliban at a time when the administration is hoping to negotiate with that group. ISKP has sworn allegiance to Baghdadi as the Caliph of a potential transnational Islamic State. The Taliban, in contrast, sees its goal of overthrowing a corrupt government in Kabul as part of a strictly ethno-nationalist Pashtun agenda. ISKP is a new phenomenon in a region where Islamist groups have had narrow national or ethnic concerns which they aim to accomplish through violent means. ISKP was formed sometime in early 2014 by defectors from groups like the Al Tawhid Brigade, and Ansar ul-Khilafat Wal-Jihad. The early success of the Islamic State in Syria and Iraq, as well as rumors about the death of Mullah Omar, (which the Taliban did not officially announce until August 2015) also resulted in defections from the Taliban, the Tehrik-e-Taliban Pakistan (TTP), Jundullah (itself a splinter of the TTP) and other groups who were attracted to ISKP because of its religious-political goals. In recent months ISKP has suffered its own split after the selection of Aslam Farooqi as head of Khorasan province. A former LeT commander with ties to the Pakistani ISI, Farooqi’s rise triggered anger among Central Asians in the group, particularly former members of the Islamic Movement of Uzbekistan (IMU) who hold Pakistan accountable for the attacks against them when they were based in Waziristan. There are now two factions of ISKP – one led by Farooqi comprised mainly of Pashtun fighters from Afghanistan/Pakistan and another led by Moawiya, a former IMU commander, comprised of Uzbek, Tajik and Baloch fighters and based in northern Afghanistan (mainly Badakhshan and Jowzjan). The Taliban is also divided, with some groups in the north and the east which retain their autonomy and do not see themselves bound to the Quetta Shura headed by Akhundzada. This has made it difficult for them to destroy ISKP, which is a significantly smaller group in terms of fighters. There is also concern that if the Taliban opens up negotiations with the Kabul government and/or the United States it could alienate members who see the Ghani government as corrupt, thus opening the door for defections to ISKP at a time when there is already concern about the flow of fighters from Iraq and Syria into this region. ISKP, despite its recent split, is more of a multinational group. Pashtun-dominated groups like the Tehrik-i-Taliban Pakistan (TTP) as well as the Lashkar-e-Tayyiba (LeT) in Pakistan have pledged allegiance to Baghdadi. In the Indian state of Kashmir, where Indian security forces have been fighting separatism for decades young protesters are frequently seen waving the black flags associated with the Islamic State. Organizations like LeT as well as Hizb-ul-Mujahadeen (HuM) which operate in the state are fertile grounds for recruitment. The Moawiya group of ISKP today counts among its numbers former members of the the IMU who are primarily Uzbek and Tajik. The group has a number of Balochi as well, some of whom are dissidents from the Jundullah group which has historically targeted Iran and Pakistan. More recently, the group has successfully recruited among the Uyghurs of China’s western Xinjiang province, where China’s treatment of this minority group has led to increased militancy and the rise of a separatist movement. The diversity of ISKP is of concern since the group has considerable experience within its ranks of fighters who moved from the region to Syria and back again after the collapse of the Islamic State in Syria and Mosul in Iraq. American military officials are concerned because areas in northern Afghanistan (such as Jowzjan) and eastern Afghanistan (like Nangarhar) have attracted fighters from Sudan, Chechnya, Uzbekistan, and Tajikistan. ISKP is competing with the Taliban and al-Qaeda, but at the same time — as the joint attack by ISKP and the Taliban in August 2017 in the northern province of Sar-e-Pul showed — coordination can and has taken place. That attack killed 50 men, women and children. The group thus has the potential to destabilize not just Afghanistan and Pakistan but the wider region. The success of ISKP in its early years was also due to its ability to provide funds and resources to its fighters at a time when the Taliban was operating under constrained circumstances. According to Antonio Giustozzi, ISKP in 2016 raised nearly $271 million from a mix of private donors, Arab Gulf States, contributions from the Islamic State in Syria and Iraq as well as local taxes levied on the areas under its control. The discovery in February 2018 of an Islamic State hideout filled with explosives and suicide vests in a poor Kabul neighborhood indicates the ability of the group to operate and move money and resources freely even within the heavily guarded capital. The Farooqi group has access to money and training facilities in Pakistan, according to some reports, while the Moawiya group has connections to Central Asian drug trafficking, racketeering networks and ties to individuals and groups with a history of soliciting funds for the IMU. As tensions rise between Saudi Arabia and Iran it is entirely possible that funds will flow to ISKP from sponsors in the Arab Middle East who are interested in offsetting Iranian and Russian support for the Taliban. Russia and Iran have reportedly provided arms and logistical training to the Taliban in a bid to limit the growth of ISKP, which is perceived as a bigger threat to their own interests in the region. China has supported these initiatives because it too has concerns about ISKP and its implications for Beijing’s economic initiatives like the China-Pakistan Economic Corridor (CPEC) as well as the political ramifications of a resurgent Islamic State for its control over Xinjiang. The Afghan government and India view ISKP as an extension of the Taliban and see it as an attempt by Pakistan to set up the Taliban as a “moderate” partner in future negotiations. Pakistan, for its part, is blaming India (and Afghanistan) for helping support elements of the TTP and ISKP who are anti-Pakistan. For Pakistan, the concern is not only the defection of Islamist extremist groups to ISKP but the fact that since 2014, law enforcement agencies have discovered small cells operating in four urban centers – Karachi, Sialkot, Islamabad and Baluchistan. he differing perspectives were on display in the last two multinational regional talks convened by Russia in February and April 2017, where the focus stayed on the Taliban and how to bring it to the negotiating table. This is also the focus of the Afghan Peace Conference that brought delegates from 20 countries to Tashkent, Uzbekistan last week. The United States as well as the EU participated in this conference, unlike the earlier regional talks sponsored by Russia. 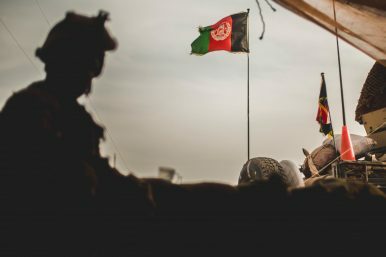 The disagreements among the major powers in the region about the real threat in Afghanistan makes it difficult to coordinate a response to the dual challenge presented by the Taliban and the Islamic State. The Trump administration has followed in the footsteps of the Bush and Obama administrations in articulating a policy aimed at preventing Afghanistan from becoming a “safe haven” for terrorists intending harm to the United States. In April 2017, the U.S. military attempted to clear ISKP fighters from a cave complex in Achin, a district in Nangarhar, with the so-called mother of all bombs (MOAB). The concern is real, as was made evident when in October 2017, the Justice Department unsealed charges against three men who plotted attacks in New York City for the summer of 2016 – two indicated that they were working with ISKP and one said he had been authorized by ISKP to conduct the planned attack. The U.S. military is holding the fort on policy in the region. It has paid the price with heavy casualties in taking on the extremists leading to the increasing use of airpower – this has only worked to halt the militants temporarily. Diplomatic initiatives are complicated by the fact that the Trump administration has weakened the State Department as an institution. The office of the Special Representative for Afghanistan and Pakistan (SRAP) which was charged with working on reconciliation efforts with the Taliban and other groups as well as promoting diplomatic outreach was dissolved in September 2017 and was folded into the broader South and Central Asia bureau. This was not difficult to do since many of the employees were working on contracts that were not renewed. The justification is that it will allow for the evolution of a broader South Asia strategy instead of focusing just on Afghanistan and Pakistan. However, this is not very convincing coming from an administration that has proposed cutting the State Department budget and been slow to fill even senior positions. The situation is even further complicated by the recent firing of Secretary of State Rex Tillerson via Twitter and the appointment of the CIA Director Mike Pompeo to that position. The appointment of John Bolton as National Security Advisor is also problematic for policy on Afghanistan. He is not only viewed as a hardliner on policy, but he has ties to the Mujahideen-e-Khalq (MeK) which was on the U.S. list of foreign terrorist organizations. The MeK is virulently anti-Iran and is viewed with hostility by most Iranians because of its support for Saddam Hussein during the Iraq-Iran War (1980-1988) and its subsequent attacks on high ranking Iranian officials in the following decades. The problems in the State Department coincide with deteriorating relations between the U.S. and regional powers like Russia, China, and Iran — just as the military option in Afghanistan appears to be having limited success and the need for more robust diplomatic efforts becomes a necessity. Professor Sudha Ratan teaches courses in international relations at Augusta University.